For families in Long Island, foreclosures are a scary prospect, but some homeowners have been faced with an even more frightening scenario. A recent lawsuit in Illinois alleges that many individuals have been illegally harassed during evictions by subcontractors representing their lenders. As the economy has declined over the last several years, there has been a sharp increase in the number of foreclosures. Some families would fall behind on their mortgage payments and move out of their home, leaving it vacant and subject to deterioration and vandals. In an effort to maintain the value of the properties, banks hire property management firms to deal with the problems common to vacant homes. These firms then subcontract the actual work to smaller companies. The subcontractors first determine if the house is still occupied. If it is vacant, they then change the locks, winterize the property, and take care of other necessary maintenance. This system tempts contractors to act dishonestly, however: because a vacant home will result in additional work for the contractor, he has a financial motivation to ignore evidence of occupancy. However, both the banks and the property management firms claim to exercise strict oversight to prevent this built-in bias from affecting their work. Unfortunately, families facing Long Island foreclosures or foreclosures in other parts of the country have a different story to tell. Homeowners recount incidents where obvious signs of occupancy were ignored and a property was incorrectly declared to be vacant. They report having their homes broken into and personal property destroyed or discarded. Others claim that they were told that they must leave their homes immediately, even though they were still in the midst of the foreclosure process. A recent $26 billion settlement between 49 states and five major banks, called the National Mortgage Settlement, has direct bearing on this situation. Although the case that precipitated the settlement dealt with banks’ oversight of their foreclosure lawyers, the terms of the settlement require lenders to carefully monitor the activities of all of their third-party vendors. These vendors, of course, would include property management firms and their subcontractors. If you are being harassed in this way by a property management firm or their representative, you do have legal recourse. Even though you have fallen behind in your mortgage payments and become involved in the Long Island foreclosures process, you should not be prematurely forced out of your home. Contact the law office of David Witkon today for a free consultation about your situation and your available options. Foreclosures in Brooklyn and throughout the New York area are something that every homeowner works hard to avoid. Most individuals know that missed mortgage payments can lead to this unfortunate outcome, but they may not realize that missed tax payments can have the same result. One Pennsylvania widow has learned this fact the hard way. Eileen Battisti, a widow living in western Pennsylvania, resides in a home worth approximately $280,000. When her husband passed away in 2004, she had to assume responsibility for the finances. As she struggled to sort things out, she fell behind on some of the property taxes due on the home. Battisti tried to take care of the debt by paying off all the taxes of which she was aware. Unfortunately, she missed a $6.30 charge that had been listed on her 2009 tax bill. By late 2011, late fees and penalties were added to that amount for a total of $235 owed to the county. Battisti states that she received no further notice of her debt until she was informed that her house was scheduled to be sold at auction. Upon receiving the notification, she attempted to obtain a court hearing but was denied. Her house was sold for $116,000 – a fraction of its worth. Just like smart homeowners facing foreclosures in Brooklyn, Eileen refused to give up without a fight. She went back to court and filed an appeal of sale. Under the law, the new owner cannot take possession of the property while the sale is being appealed, so Eileen has been living in her “sold” home for nearly two years. Recently, a judge ruled that the court should not have denied her original request for a hearing. The relatively small amount owed compared to the value of the home should have at least merited a consideration of her case. The final outcome for Eileen Battisti remains to be seen, but at least she will have an opportunity to present her case in court. Her situation is not an isolated one, however. Many local governments are using delinquent tax payments as a way to bolster tight budgets and are aggressively pursuing homeowners with late or missed payments. Although this particular case may have been mishandled, many others have been conducted completely within the law. One report states that a year’s tax lien sales equal more than $15 billion. If you are facing foreclosure due to delinquent property tax payments, it is important to obtain good legal representation as quickly as possible. The professionals of Witkon Law are ready to help with foreclosures in Brooklyn and throughout the Long Island area. Contact our office today for a free consultation. Tenants in one Bronx rental complex have had enough of delays and empty promises. Despite being taken over by the New York City Housing Authority, this facility still has serious deficits in its security and other important amenities. Middletown Plaza is a senior housing facility located in the Bronx. It is a 15-story building with 178 apartments and was originally constructed in 1973. The nearly two hundred seniors that live in this complex, however, are fed up with the facility’s deficiencies. For years, residents have been asking that security cameras be installed in the building’s elevators and hallways and also in the area around the complex. More than a year ago, the New York City Housing Authority (NYCHA) promised that they would address the security concerns as well as some other repair issues. In fact, as early as 2011, the city council designated funds to make the security improvements. Work started on the project in March, but the cameras are still not operational. In the meantime, other issues with the Bronx rental facility continue to develop. In June, rainstorms flooded the building, putting elevators out of commission and rendering stairwells unusable. With no accessible exits, some senior citizens were trapped in their apartments. Although it is perhaps the most flagrant example, the Middletown Plaza facility is not the only one with problems. The NYCHA runs a number of rental complexes around the city, serving more than 600,000 tenants. Many of these residents have serious issues with the city’s management of their buildings. In fact, one mayoral candidate questioned why so many NYCHA buildings were in disrepair when the Authority has nearly $700 million available for its use. Facilities in disrepair and poor landlord response to tenant complaints are problems that are not unique to this Bronx rental facility. It is reasonable to expect better things from a city-run housing authority, but in reality these issues are common to many tenants across New York City. It is important that landlords and management companies be held responsible to provide reasonable accommodations and security measures for their residents. Putting off or delaying repairs must be addressed by legal action, if necessary. If you find yourself in a situation similar to the tenants of this Bronx rental complex, you need a lawyer who will help to protect your interests. David Witkon Law has experience working on behalf of New York area tenants to deal with difficult landlords. Contact our office today for a free consultation about your situation. A recent Manhattan housing case has given all Queens landlord tenant lawyers some cause for concern. Their unease stems from the fact that the court found in favor of the tenant, but the lawyer–not the landlord–was the one held liable. Rafael Lee, an 82-year-old immigrant, has lived in a rent-controlled apartment in Manhattan since his arrival in the United States in 1965. His rent is set at $790.30 a month, but he also has a $400.00 rent subsidy from the Senior Citizens Rent Increase Exemption program. A notice was given to Mr. Lee that eviction proceedings had been initiated against him for nonpayment of rent, but the figures did not take into account his $400 rent subsidy. Mr. Lee quickly obtained a lawyer, who informed the landlord’s law firm of the error. Once the law firm verified that a mistake had been made, they initiated a motion to discontinue the case against Mr. Lee. This case sets an unusual precedent for Queens landlord tenant lawyers and indeed for all lawyers in this practice area. The court’s decision was based on a federal law, the Fair Debt Collection Practices Act, which is designed to hold debt collection agencies accountable for any errors that they make. Law firms have reacted to this decision by instituting procedures to verify information provided to them by their clients in an effort to protect against future lawsuits of a similar nature. If you own rental property and employ a Queens landlord tenant lawyer, it is important to be sure that your attorney is careful and accurate in his data collection. Although this case found the attorney to be liable, there is no guarantee that a future case may not hold a landlord culpable as well. The Witkon Law Firm is ready to help you with all aspects of New York’s complex and ever-changing landlord tenant law. Contact the office today for a free consultation on how to protect yourself from lawsuits like this one. To residents in Suffolk County, eviction is a dreaded threat. Not only does it remove them from their home, but having an eviction on their record can make it nearly impossible for them to find another affordable place to rent. A new trend sweeping the nation’s cities could give them yet another reason to be fearful of this outcome. Many cities have passed or are considering laws known as nuisance property ordinances. These laws are designed to deal with neighborhoods that have high crime rates. Under such ordinances, landlords are required to evict tenants if the property requires frequent visits from the police due to 911 calls from the tenants or neighbors. Although the laws sound good in theory, their application has resulted in some unexpected consequences. One single mother in Pennsylvania discovered firsthand how this legislation might affect some tenants. She had called 911 at various times because of an abusive boyfriend. After one call, the police told her that they would ask her landlord to evict her if they were called again. The abusive boyfriend was released from jail and showed up at her property demanding to stay. Rememberig the police’s warning, she felt that she had no choice but to let him in. Within a few days, there was another argument with the man that resulted in him attacking her with a broken ashtray. Despite the four-inch laceration on her neck, she begged her neighbor not to call 911 lest she be evicted. After she passed out, her neighbor called, and she was airlifted to the hospital for treatment. Despite her obvious injuries, city officials ordered her evicted from the property. Once the woman got the ACLU involved, the city backed down from its eviction demand, but these laws are still on the books in numerous other cities and towns. It may not be long before Suffolk County evictions are occurring on this basis as well. Although no one wants to live in a neighborhood with a crime-ridden property, there is some question as to whether penalizing residents for calling 911 is the right answer. Such laws seem to unfairly discriminate against battered women and minorities. They also make individuals hesitant to call the police when they need help. When the laws are used as the basis for an eviction, the affected parties have little or no legal recourse. It is important for area residents to be aware of the guidelines governing Suffolk County evictions, and it is always a good idea to secure legal advice whenever you have a concern that your home may be in jeopardy. The attorneys of David Witkon Law are experienced in dealing with landlord tenant situations and can help you think through your available options. Contact the office today for a free consultation. According to New York state law, Nassau County foreclosures can be either judicial or non-judicial. These terms are unfamiliar to many, and often homeowners are unaware that their house may be eligible for a non-judicial foreclosure. A judicial foreclosure is the more common type of foreclosure proceeding in the state of New York. In this process, the lender files suit against the borrower for nonpayment. There is typically a lengthy court proceeding to determine if the lender has the rights to the property and if the borrower is truly in default on the loan. During this time, the borrower can offer a defense and may be able to negotiate a settlement with the lender. If the court decides in favor of the lender, the borrower typically has a period of time in which to pay the amount owed. 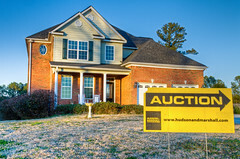 If payment is not made, then the court will authorize the sale of the house, often by public auction. Most Nassau County foreclosures are of this type. A non-judicial foreclosure is a much faster process than a judicial one. As is evident from the name, this type of foreclosure does not involve the court system. In a state that permits non-judicial foreclosures, buyers sign an additional piece of paperwork when they receive their mortgage. This paper contains some special wording known as a power of sale clause. This clause gives the lender the authority to sell the property if the buyer defaults on their mortgage payments. Since the legal authority has already been granted, this process can occur very quickly. The only warning that an individual may receive of an impending foreclosure is the notice that the house is up for sale. At this point, the borrower has very little time to produce a payment or mount any sort of defense. In fact, since the court system is not involved, the borrower must be the one to file a case to obtain a temporary injunction to prevent the sale. This process can be very fast and scary for an unprepared homeowner. This sort of legal situation is a perfect example of one of the reasons homeowners should seek legal counsel to protect themselves against Nassau County foreclosures. Potential homeowners may sign paperwork permitting non-judicial foreclosures without even being aware of its inclusion. Those who receive a notice that their home is being sold are nearly completely defenseless without legal guidance. Don’t wait for this kind of scenario to happen to you. Contact Witkon Law today for a free consultation on your potential property purchase and ensure that your home is protected from such summary action. Homeowners facing foreclosures in Suffolk County and throughout New York will soon get a little relief, since the governor has agreed to sign a newly passed bill into law. The bill is designed to eliminate loopholes that allow foreclosure cases to stall in the court system. The foreclosure process is initiated when a lender files a complaint against a homeowner for not paying his mortgage. After filing the complaint, the lender then files a Request for Judicial Intervention (RJI), which officially starts the judicial process. Once this request is received, the courts schedule foreclosure settlement conferences between the homeowner and the lender, provide housing counseling, and offer free legal advice. In the past, there have been difficulties with lenders starting foreclosure proceedings even though they are not legally the owners of the loan. To deal with this problem, in 2010, a law was passed that required lenders to file an affirmation that certified the legitimacy of their lawsuit. They were to file the affirmation at the same time as the RJI. Unfortunately, instead of simply filing both sets of paperwork at the beginning of the foreclosure proceeding, many lenders began to delay the filing of the RJI to allow more time to prepare the affirmation. As a result, homeowners were caught in what is termed the “shadow docket.” Foreclosure proceedings have been initiated against them, but they do not yet have access to the mediation and services offered by the court system. As they wait, interest and fees continue to climb, increasing the amount they owe to their mortgage company. Unfortunately, homeowners that fall into this “shadow docket” typically lose their homes completely. As more foreclosures in Suffolk County and other parts of the state got stuck in the “shadow docket,” lawmakers began to look for a way to address the problem. Their solution was a bill that requires mortgage lenders to submit the affirmation when they initiate their foreclosure lawsuit. This plan will eliminate the reason for the delay in filing the RJI and will give homeowners immediate access to the resources available to them through the court system. The bill was approved by the state legislature in June and then signed into law by the governor on July 31st. The law will go into effect 30 days from that date. If you are one of the homeowners battling foreclosures in Suffolk County or in Nassau County, Witkon Law can help to protect you against unscrupulous lenders. An foreclosure lawyer can ensure that the law is followed to the letter and that you receive the protection you deserve. Contact the Witkon Law office today for a free consultation. A recent occurrence should encourage landlords offering Bronx rentals to take a little more responsibility for their properties. A judge in the Bronx Housing Court finally ordered the arrest of a local landlord for his extreme negligence. Joel Loutan owns a four unit building in the Bronx. Mr. Loutan has a history of not properly caring for his property. The building is reported to have a collapsed roof, leaking walls, rotten support beams, and broken boilers. In 2009, the building was placed in a program administered by the New York City Department of Housing and Property Development. This program, termed the Alternative Enforcement Program (AEP), is designed to use the power of the law to force landlords to make necessary repairs. The AEP ordered Mr. Loutan to replace the building’s collapsed roof, rewire the building’s electrical system, repair the outside walls, and replace the heating system. Mr. Loutan has continued to ignore these orders. In fact, both he and his attorney have completely missed several court appearances. After nearly four years of this behavior, Judge Jerald Klein of the Bronx County Housing Court issued a warrant for his arrest. This is only the fifth time in an eight-year period that a warrant has been issued for a recalcitrant Bronx rental owner. More often, the AEP simply makes the repairs and then bills the landlord for the cost of the work. This landlord, however, has shown such blatant disregard for the law that arrest was the only solution. Some tenant advocates claim that these types of situations are not as unusual as the statistics might indicate. One organizer for a local tenants’ union tells of many landlords who refuse to make the necessary repairs requested by their renters. To avoid legal action by the city, they eventually evict their current tenants, perform the needed renovations, and then raise the rates and attract a new group of renters. Tenant advocacy groups argue that the city is still not doing enough to protect residents of rental properties. The arrest warrant is good, they say, but it is sad that it took four years of the landlord’s irresponsible behavior before it was issued. Does your residence have unsafe living conditions that your landlord refuses to address? You need an advocate that can represent your interests and advise you on your available options. The professionals of Witkon Law are ready to deal with Bronx rental situations and are happy to serve as your representatives in any necessary legal action. Contact the office today for a free consultation about your unfavorable living situation. The Tenant Fair Chance Act came about as the result of a class action lawsuit filed in 2006. The suit was brought against a company called First Advantage SafeRent, Inc. (FAS). The company is one of many that perform background checks on potential tenants for New York City landlords. One part of the check involves determining if the individual had been involved in any housing court cases. The lawsuit alleged that FAS provided only part of the information on individual’s court histories. Their reports did not include important information such as whether the tenant’s actions against their former landlord were found by the court to be justified. Since New York City court cases are identified only by individuals’ names, some background reports falsely stated that a prospective tenant had been involved in housing court when actually it was another individual with the same name. FAS lost the lawsuit and was required to pay $1.9 million. The Tenant Fair Chance Act was passed to help protect potential tenants from being unfairly blacklisted as undesirable renters. Under the Tenant Fair Chance Act, an owner of a rental in Nassau County and throughout New York City must inform potential tenants if they use an agency to perform background checks. The landlord must include this information on the rental application along with the agency’s full name and address. If a landlord rejects a rental applicant based on information obtained from that agency, the individual has a right to see and challenge the report. Tenant Background Search is a Texas-based firm that handles the screening process for many New York City landlords. This organization recently urged its clients to ensure that they are in compliance with the Tenant Fair Chance Act. Failing to provide the required information opens landlords up to serious legal action. In actuality, the new law has positive effects for both tenants and landlords. Tenants can defend themselves against unjustified blacklisting. Landlords can rent to good tenants who might otherwise have been mistakenly disqualified. An experienced landlord tenant lawyer may be necessary at several points along the process of rental in Nassau County. Landlords should have a qualified attorney review their paperwork and procedures to make sure that they are compliance with the law. Individuals who have encountered a landlord that failed to follow the provisions of the law should seek counsel as to legal action that might be necessary. Potential tenants who were wrongly rejected definitely need legal help to challenge the screening company and clear their good name. If you find yourself in any of these situations, contact the law office of David Witkon today for a free consultation. For any group of tenants in Long Island, eviction is always a fear, even if a distant one. Typically, however, the landlord initiates an eviction. When tenants are instead removed from their dwellings by the city, the results can be devastating. Unfortunately for these individuals, the owners of their building have a history of poor property management and have been cited with numerous code violations. In November of 2008, the city ruled the tenement too hazardous for occupancy and expelled the residents from their homes. Nine months later, they were finally permitted to return. Despite this incident, management continued to neglect the upkeep of the building. On March 7, the history of this Manhattan eviction was repeated. The previous week, news station CNN had run a piece about the living conditions in the tenement. An Arizona viewer saw the report and called the city. In response, the city issued a vacate order. New York Fire Department personnel arrived at the building in the middle of the day when most residents were at work. They broke down the doors to all the rooms, and, as tenants returned home, informed them that must immediately leave the premises. The Red Cross offered shelter for a few days, but residents soon found themselves on the streets. Now, more than four months later, these individuals are still homeless. Despite promises that management would address code violations within two weeks of the eviction, the building remains unsafe for occupancy. Tenants have organized protests to no avail. These individuals seem to have been overlooked and forgotten by both the city and their landlord. Only time will tell if they will again be able to obtain housing that is both safe and affordable. There are things tenants can do to prevent this Long Island eviction story from repeating itself. It is vital for residents of a building to stay aware of the conditions of their dwelling and take steps to force landlords to deal with violations. If a landlord does not respond to requests, legal action must be taken before the living conditions become hazardous. If you have concerns about your landlord’s response to problems in your dwelling, you should protect yourself by seeking legal counsel immediately. The Long Island Landlord Tenant attorneys at Witkon Law are happy to help you consider your options. Don’t allow your landlord’s neglect to cause an eviction in Long Island. Contact Witkon Law today for a free consultation.